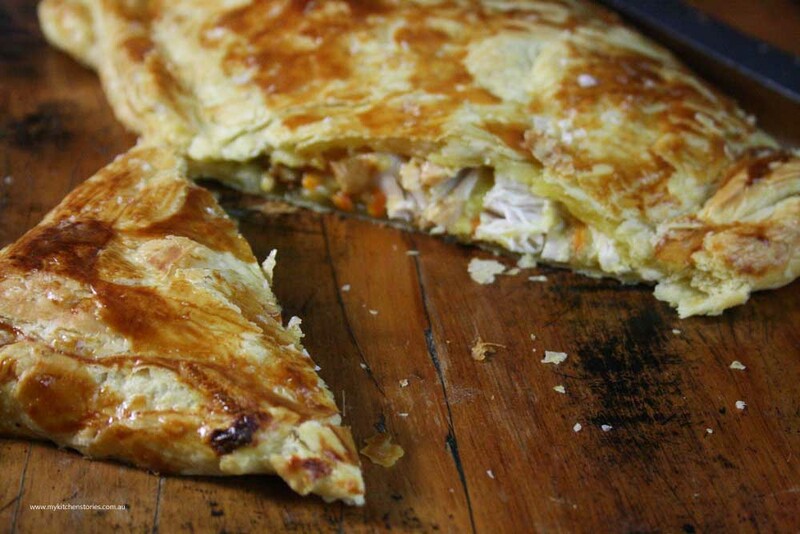 This Tortilla Chicken Lasagne / Pie looks good doesn’t it? It is or rather was. I am sure one of these has been made somewhere sometime, but I got the idea from Skater. I asked him what he wanted for dinner. He said Tortillas ..Oh no wait, maybe pie. Can I have a Tortilla Pie? Of course you can . I love a challenge. To be honest it is pretty easy. There are several of steps but you really can’t go wrong. It requires a couple of really Mexican style ingredients to make it extra special. 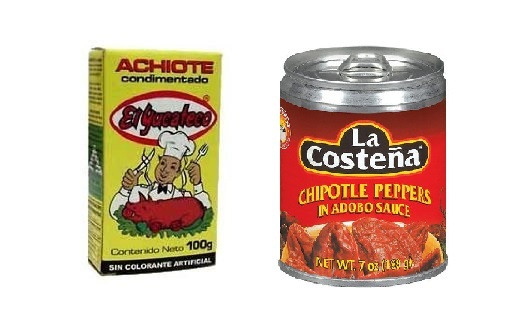 One of those is Achiote seasoning. It has colour and taste and I love it with chicken but also use it in other Mexican dishes. This can be sourced in some delis or online. ( mine comes from Fiji market in Newtown -if you are in Sydney) There is also a little chipotle chilli in adobo sauce in here. Just a touch as Skater doesn’t love chilli , he’ll just tolerate a little but the flavour of these chillies is really a must. You can find these in IGA stores, delis or on line. The thing he really loved are the steamed ears of corn smothered in homemade lime mayonnaise and sprinkled with smoked paprika. Don’t skip the smoked paprika. I used a round ceramic dish about the same size as my tortillas. This helped them stay upright and pie like. You could use a cake tin if you don't have a ceramic dish. You could also use gluten free tortillas. 250 gm Cheese Grated however much you want but set some cheese aside for the top. Heat a medium sized pot or fry pan with high sides and add 2 Tablespoon olive oil, bacon and the chicken and cook stirring until it turn white and is just starting to cook. Add onion, garlic, spices and herbs and stir till fragrant and the onions have softened. Add the beans and tomato puree / passata. Add the achiote paste mixed with 1 tablespoon of boiling water and break it down before adding to the tomato sauce. Put a little sauce at the bottom of your pie dish and put a tortilla down. 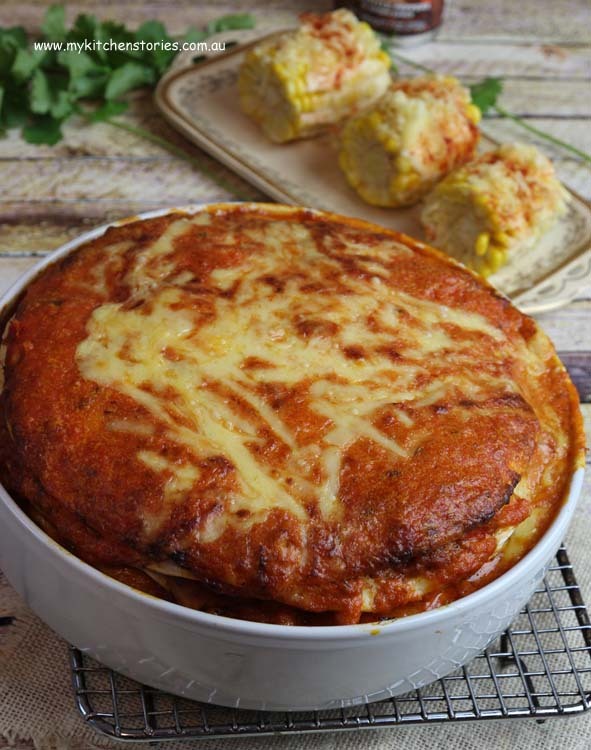 Continue with all of the tortilla's and sauce till they are all used, adding some grated cheese to alternate layers as you go. 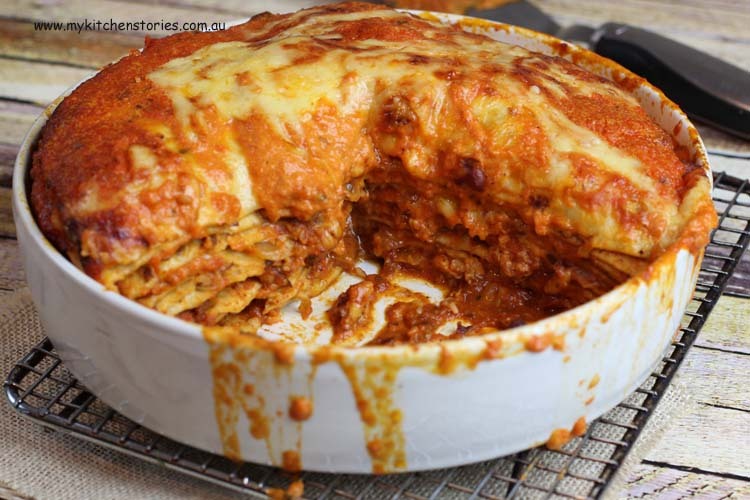 There may not be a great deal of sauce on the layers, just enough for flavour. Finish with a tortilla. 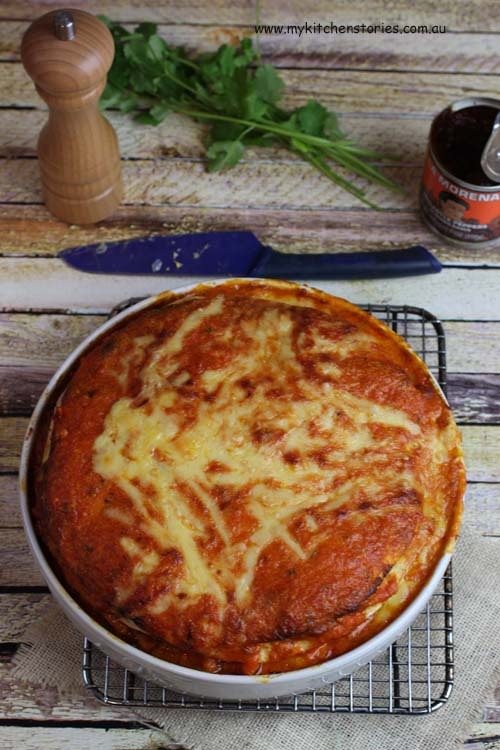 Cover with the tomato cream sauce by pouring it over the tortilla lasagne ( you may not need all of it depending on the size of the dish you are using). Sprinkle with the reserved cheese. Tent very lightly with foil, with out touching the cheese. Bake for 20 minutes then remove the foil and bake till bubbling, about another 10 minutes. 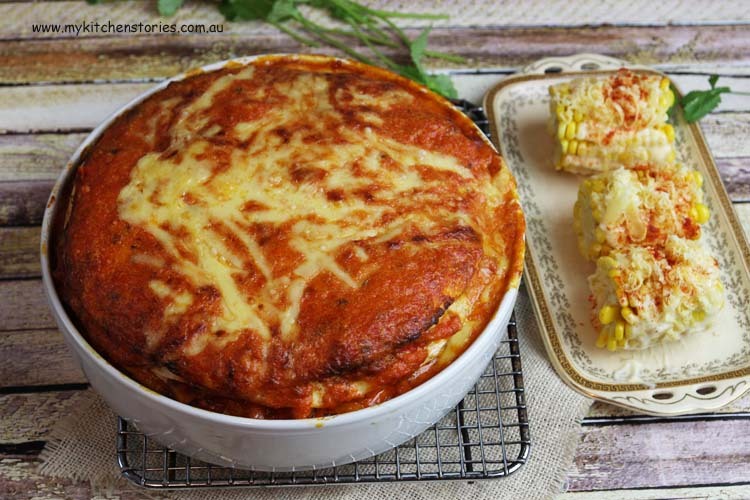 Serve with steamed corn. Just before serving spread with mayonnaise onto the serving side of each piece of corn sprinkle well with grated cheese and smoked paprika. The tomato sauce doesn't need to be reduced right down or you will not have enough sauce for the 9 layers. Just a bit of sauce on each layer is enough. 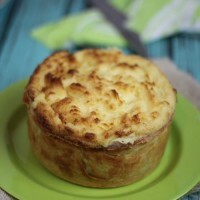 The tomato cream sauce should be reduced enough so that it becomes easy to pour over the top of the pie and stay there. These are some off Skaters favourites too, this Ricotta Red Pepper Pie . Amazing. 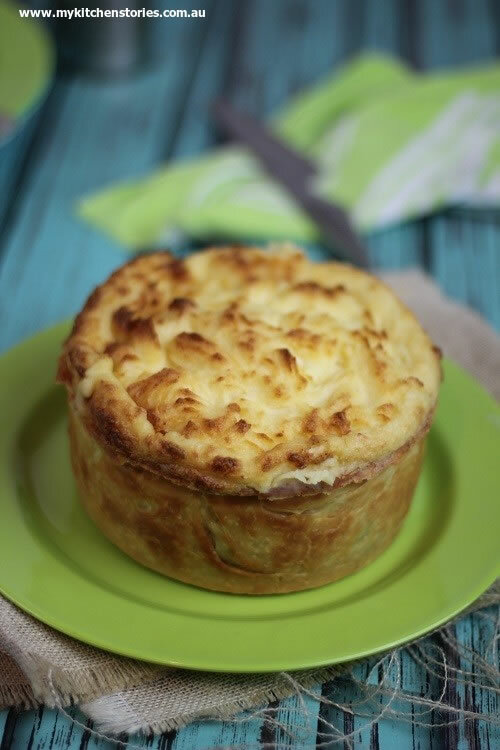 Genius to use tortilla in this way! The perfect answer to the challenge. Looks like perfect boys food – will keep this in mind for the night poker night. I have made stacks of tortillas before like a cake on a tray but never in a pie dish. That is actually better so all the good stuff doesn’t ooze all over the place like with my system. That sure looks appealing. I’m going to call one day and try, ‘Mum, I’m coming home for dinner and can we have …” and think up wacky ingredients. You are so clever and this looks amazing! Tania this looks fantastic. All my favourite things in one dish. You really can’t go wrong with Mexican for dinner can you? Looking at all these pics, I can bet it is so darn flavorful!! My mouth is watering so bad!